I made two muslins, and extensive alterations—more for freedom of movement than fit per se. And I would’ve sworn that the best things about both muslins was that the shoulders FIT. Well, I tried the shell on Osiris and the shoulders are huge. I honestly couldn’t tell you anything else about the fit, I couldn’t see past the massive, sloppy shoulders. Yes, the shoulder-pads were in place. I’m not quite sure what’s going on. There is a lot of room in the back (as per his demand), but that’s not the issue. It’s like the shoulder point has expanded. Which it shouldn’t be able to, right? I’m hoping some re-adjustment of the pads/sleeve headers will help the issue. The armscye also seems low, where I swear the opposite was going on in the muslin. This may be a difference between firm sheet and soft (ish) wool (ish)? Grum. It doesn’t help that I’m not allowed to take fit photos, and he’s not exactly keen on standing around while I attempt to note down every little wrinkle. But he does like it. Or says he does. On to construction and confusion. Sherry has one lovely post on sewing a sleeve vent, which she helpfully links to from her sewalong. 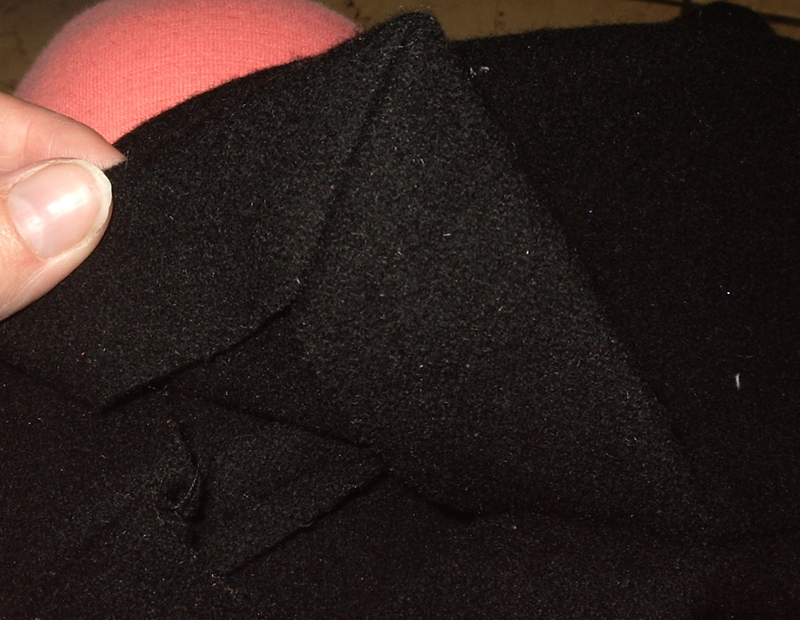 And I obediently followed her directions for adding a mitred corner to the sleeve pattern. For both the upper and under-sleeve. For future reference, you only want the mitre on the upper sleeve (the top portion of the vent). 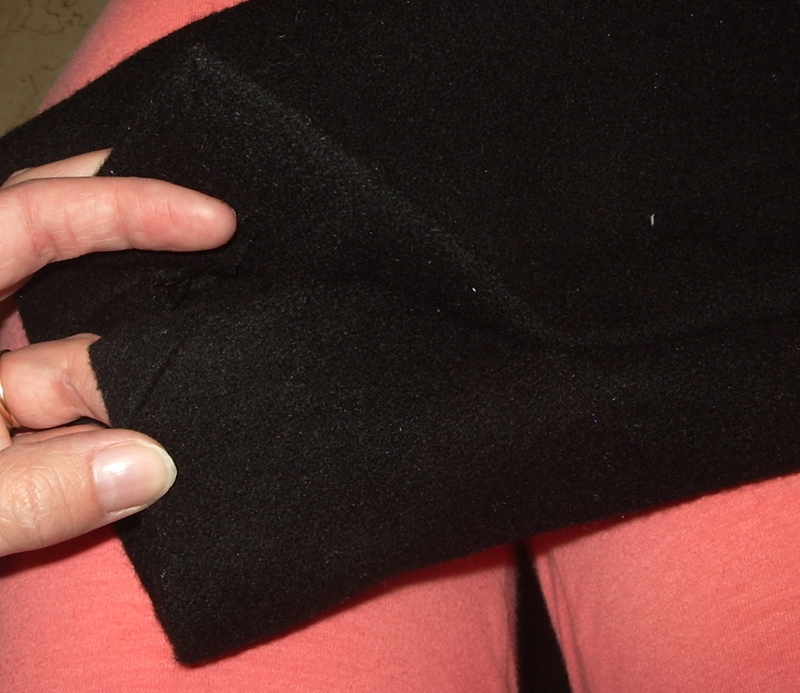 The under sleeve needs a regular corner to underlap beneath the top side of the vent. So, unless I wanted my vents open, I either had to re-cut the under-sleeve (which I doubt I have fabric for) or get creative. Creativity. See the little seam? I got creative. I pieced in a little snippet of left-over block-fused fabric. You can see just a little bit of the seam. It’s a bit bulky, but it’s going to be invisible once the buttons are stitched on anyway, right? Next up—figuring out how to line a vent. Ideally without resorting to massive hand-stitching, although I must admit soothing, mindless hand-stitching does seem a bit more attractive than brain-busting RTW-style sitching tricks, right now. Hmm. Maybe I’ll insert the whole damn lining by hand. If not, I’m thinking this book should cover it. If I can get a good fit, anyway. That’s probably unforgiveable, isn’t it? I know—Clio’s post mentions many of the things I do for my own patterns! The problem is I didn’t notice any of these issues in the muslins. I didn’t widen the shoulder (at the front, I did add the easing at the back); the height of the bottom of the armscye seemed good—now it seems way low. Men, I know. In the future I will stick to fleece pullovers. Those always work and take mere hours from start to finish. I did the same thing, widening the shoulders at the back but not the front–I think I got the idea from Fit for Real People. Your easing looks orders of magnitude better than mine! In my case its unfortunate, but I don’t think “ruched” shoulders will catch on as a design feature in menswear any time soon. I too have had a number of not so nice surprises when going from muslin to coating material. For me, the problem is undoubtedly related to my less than stellar ironing skills. The Pressinatrix would not be happy! 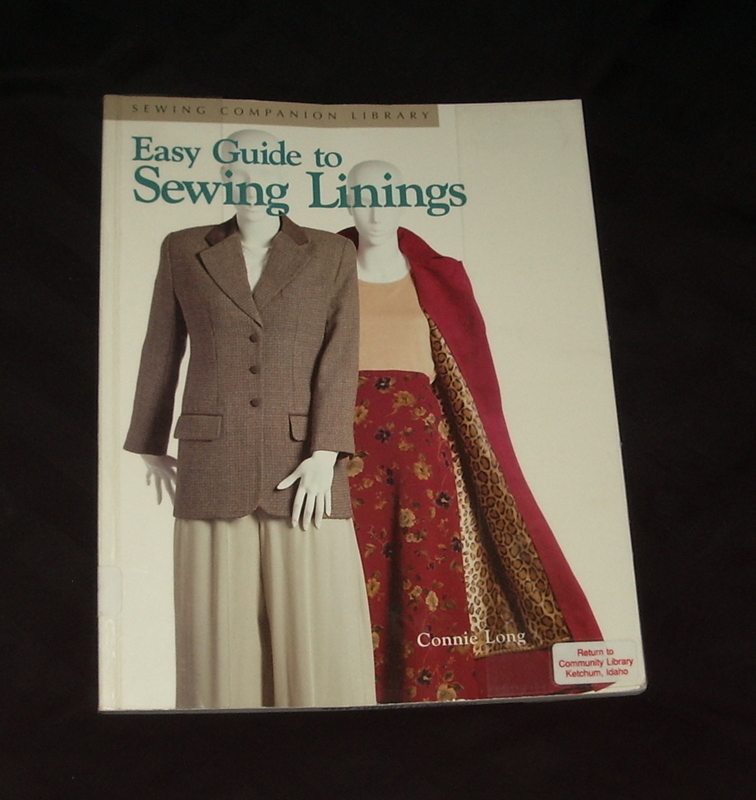 Do you actually have the Easy Guide to Linings book? It’s really hard to find and looks like the only book out there just on linings but I often wonder if it’s worth the amount of money rare second copies cost. I do—I bought it second hand via amazon last summer for about $17, I think? Plus the inevitable cross-border shipping… Although a quick google shows that it can go for a LOT more—I would not have paid $100 for it! I hate it when I change fabrics from my practice pieces and the whole fit changes! ;( I admire you for perservering as I am prone to folding the garment up and hiding it in my stash. Well your sleeve vent looks awesome – even the creative fix bit! For lining I usually just cut it straight and line over the vent easy-peasy like, as they are usually non-functional anyway. Menswear usually does have more structure to it than the sew-along, you could check inside his old coat to see what they’ve used. One thing I’d check with the shoulder length is that the neck is sitting correctly, it can stretch out a bit if the collar isn’t on. 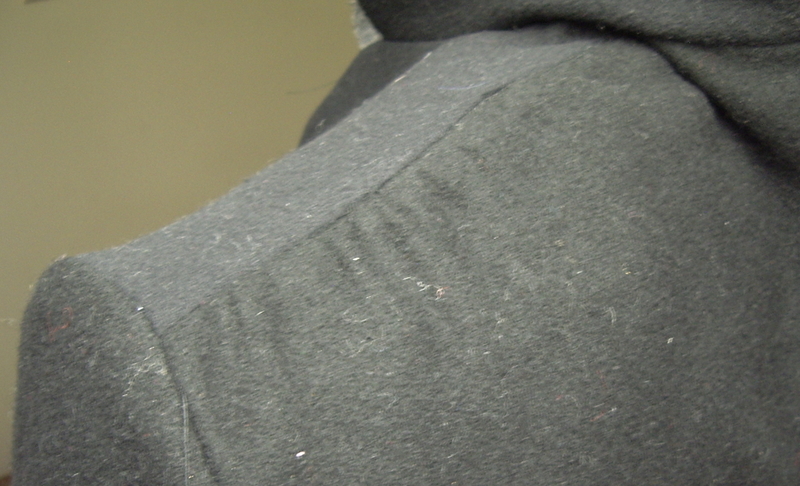 Also taping the shoulder and/or armscye will help fix things – if you haven’t done that already! Have fun – I know you like making coats! Have a look in the thrift shop for a heavy weight coat (hey, you need to go back for another haul of patterns/books anyway) to open up. Might be worth a crack. You are a trouper, I have yet to really have the desire to sew a longer term project like that. It would likely end up sitting in a UFO pile of doom until next winter. I wish I had some practical advice, but keep posting about your progress, I like reading about it. I like sewing coats, but not like this—this is way too drawn out and frustrating. If you work on them fairly intensively, even a major coat can be done in a month or two, and working consistently it doesn’t feel nearly so glacial. Try the Made by Hand blog that’s in your blogroll, there’s quite a bit of information and pictures there that should help! There is—it’s so cool, although I often don’t understand exactly what he’s talking about ;). The problem with tailoring, for me, is understanding both what any given feature does, and knowing whether or not that’s what I want. /sigh. 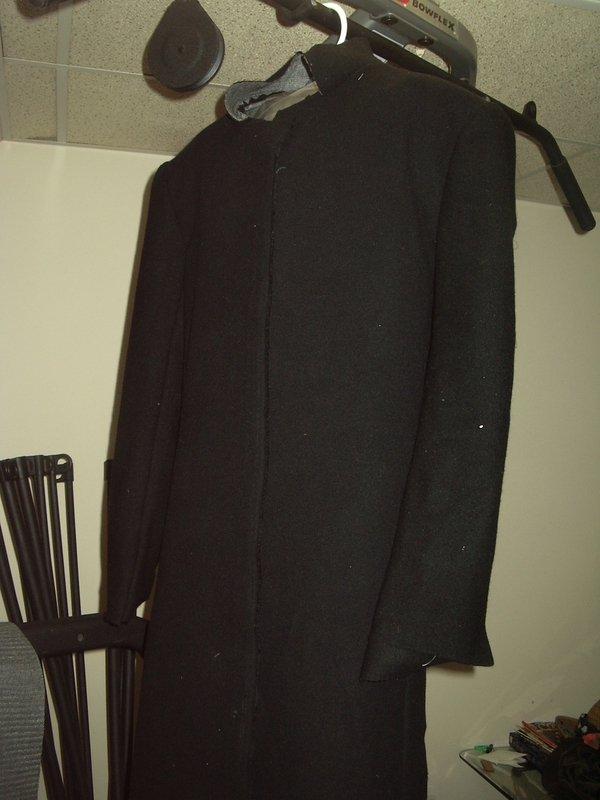 I think that will be one seriously cool coat when/if he lets you work on the fitting issues. (with a snort of disgust, all together now) MEN. That all looks like hard work. I’m sure he will love wearing it. Good fix on the sleeve vent! I understand your annoyance about details that are aesthetically pleasing *only*, but a working sleeve vent on a man’s coat is, well, something that I’d pass over and just play dumb if ever asked about it. 🙂 As for your lining…. it may be onerous, but mindlessly hand-stitching in garment linings is one of those things I find strangely calming in my borderline chaotic world. Fell stitches are quick, invisible and strong, particularly with a heavier fashion fabric, and you can control the fabric waaaaay better than machine stitching it in. Oh we all have these sewing conundrums. I do have to admit that having a wool coat lends itself to more of a tailored jacket but I think you can do a lesser one with that fabric too. I have faith in you! YAY FROCK COAT! Well, yay on finding the umph to look at it again. Sorry to hear it’s being a pain. *pfft* to winter coats, stubborn things that they are. Or is that the person they’re for? 😀 Mine is still hanging on Mabe the Sewing Assistant, lacking buttonholes/buttons and unhemmed sleeves. 😛 Maybe we should have a race to see who finishes first! Even with mine fully lined, I suspect you’ll win. Gosh, It’s a learning experience, but it really looks ad if it will be worth it. And you know you can do it, you have the skill and patience. It’s going to be super cool….